July is busy with shark events around the world, including the ever-popular Shark Week, Shark Awareness Day and SharkCon. Let’s not forget to celebrate their fantastic flat cousins, rays and skates, and some of the top places to dive with them. Rays and skates have been in the ocean since 150 million years ago and there are approximately 500 different species of them alive today. They include stingrays, electric rays, butterfly rays, manta rays, guitarfish, sawfish and more. Whilst divers may focus on shark diving, there are some incredible dives with rays just waiting to be experienced. There are around 220 stingray species in the world, including eagle rays, and they are found in warmer waters throughout the world. In contrast to their reputation, stingrays such as the southern stingray are great to dive with and are easy-going and curious rays that will approach divers closely. The southern stingray is especially popular to dive with at Stingray City in the Cayman Islands. Diving Stingray City is an experience that is hard to match; a long shallow dive in crystal clear waters surrounded by huge friendly stingrays. It is a hugely popular dive spot, not only for scuba divers but for snorkelers and even swimmers who come to meet the rays. Photographs of people diving with dozens of rays are what most people associate with scuba diving there. Stingray City liveaboards, such as the Cayman Aggressor V, avoid the crowds and get down to play with the stingrays in slightly deeper waters. 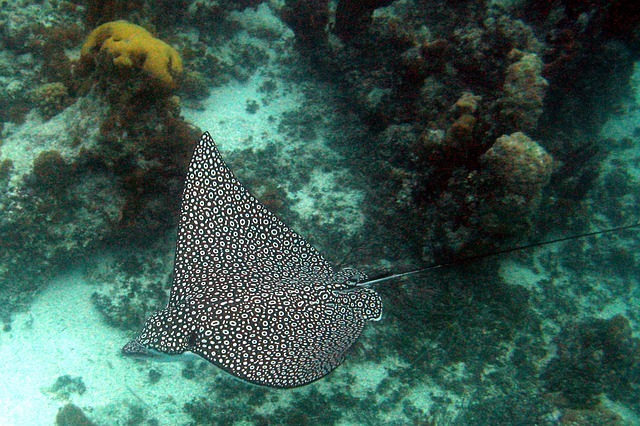 Spotted eagle rays are surely one of the most beautiful rays, with their white spots and long tails. They are found in warm waters in the Atlantic, Pacific and Indian oceans and are often seen leaping out of the water. There are various great places to dive with them, including French Polynesia. December to March is the spotted eagle ray mating season in French Polynesia and divers can enjoy seeing large schools of these rays, plus hammerhead sharks that visit the area to hunt the rays. December also happens to be humpback red snapper mating season, which brings in numerous jacks and dog tooth tunas. It is a great liveaboard destination to experience far-flung paradise islands and dive with both rays and sharks. The French Polynesia Master offers year-round safaris to explore the best dive sites in the area. There are two species of manta ray and reef manta rays are the smaller of the two; still growing to a huge 5.5 meters in size. This type of ray is found in warm waters around the world and tends to be resident to a specific area or a coastal inhabitant. They are great to dive with, putting on a show with their barrel rolls, feeding behaviour, and activities at manta cleaning stations. 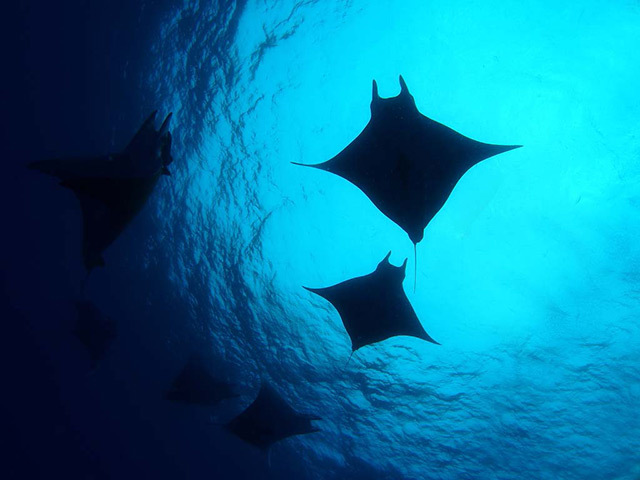 One of the most popular places to dive with reef mantas is the Maldives, but there is another great destination for a unique manta experience; Kona, Hawaii. 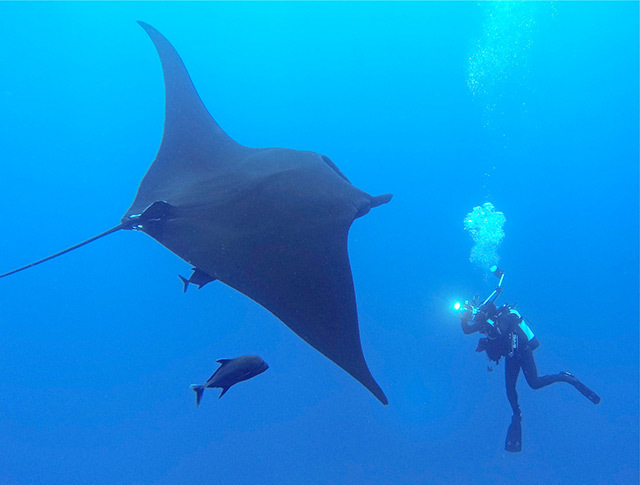 Divers and snorkelers alike can experience night diving with manta rays off Kona. It is considered one of the best dives in the world and divers can also enjoy other great dive sites of Hawaii. The Kona Aggressor II offers liveaboard safaris that include manta ray night diving. Giant manta rays live up to their name, growing to an enormous 7 meters across and weighing up to 1350 kg. 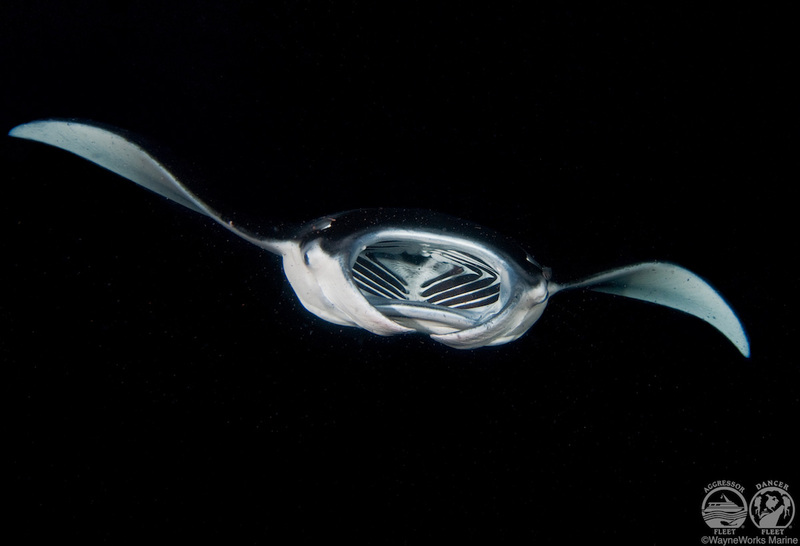 This species of manta migrates across open oceans and is an impressive ray to dive with. The Socorro Islands in Mexico are famous for their giant manta rays that congregate at sites such as the submerged pinnacle and cleaning station ‘The Boiler’. The mantas of these islands are known to be friendly and seem to really enjoy the presence of people. Giant manta rays can also be dived with at the Sea of Cortez, Mexico. Visitors to the Socorro Islands can also dive with hammerhead sharks, silky sharks and dolphins. The Nautilus Explorer offers safaris to the Socorro Islands from December to June each year. Mobula rays look similar to manta rays and are often referred to as devil rays, or flying rays due to their spectacular breaches high into the air. Divers can enjoy huge swimming with huge schools of mobula rays and see them jumping out of the water and twisting in mid-air next to their dive boat. Cabo Pulmo is a great destination to experience this phenomenon and the Rocio del Mar offers dive safaris there. The Banda Sea, Indonesia is another great destination for seeing schools of mobula rays.